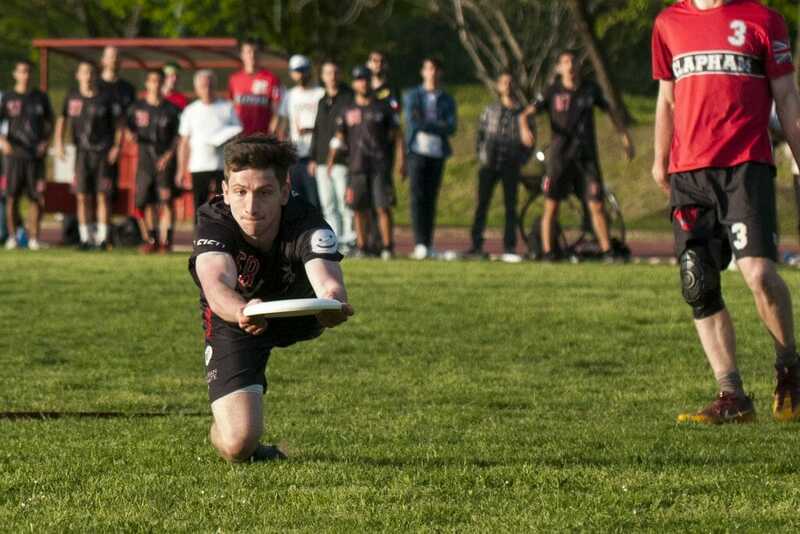 Some big surprises at a European WUCC warmup. The European Men’s club season is getting an early start in Bologna, Italy, at the Bologna Invite. The tournament is organized by the Bologna Men’s team CUSB La Fotta and has 12 high powered Men’s teams, most of which will be going to WUCC in Cincinnati later this year. Today kicked off the tournament with pool play and the first round of power pools; it brought lots of early season excitement and some very surprising results. The format of the tournament starts with three pools of four teams. The top two from each pool make up two power pools of three. Then the top two from each of those power pools match up in a final. Clapham (London, UK) handled this pool fairly easily with their closest game a 14-9 win over FWD>> (Vienna, Austria). However, the surprises here came further down the line. Many would have expected FWD>> to get 2nd in this pool after a very impressive 6th place finish at the EUCF last year. However, they managed to lose to both Freezzz Beezzz (Bruges, Belgium) and Family (Dusseldorf, Germany). All the teams in this pool are going to WUCC, but some were surprised to see Freezzz Beezzz and Family qualify last year over some traditionally strong teams in their country. However, getting wins over FWD>> is a big statement for both these teams. Freezzz Beezzz beat Family 9-8 in the final round of pool play to grant them a spot in the power pools. Bad Skid (Heilbronn, Germany) ended up winning this pool fairly comfortably except for a narrow 13-12 win over thebigEZ (Vienna, Austria). thebigEZ made a great showing against Bad Skid in that round, but, aside from that close loss, they were blown out by the rest of the competition in this pool including La Fotta’s 2nd team (Bologna, Italy) made up of the best players in Bologna who are not making the trip to WUCC later this year. Ragnarok (Copenhagen, Denmark) were a clear 2nd place in this pool and also advanced to power pools. Pool C had the craziest results of pool play. Things kicked off with a shocking upset as Guayota (Tenerife, Spain) defeated the EUCF bronze medalists, Flying Angels Bern (Bern, Switzerland), 13-12. Guayota has had a lot of success in beach ultimate and are now starting to gain traction in grass as they won Spanish nationals last year, but this was surely their biggest win on the European stage in quite a long time in Men’s grass ultimate. It seemed like their fire may have flamed out as they lost to Inside Rakete – the German National team program missing top players who were competing for German and Swiss clubs at the tournament. But this was not the end of the story for Guayota. They made an even bigger statement, though, by beating the hosting CUSB La Fotta (Bologna, Italy) 12-11. With Flying Angels beating Inside Rakete, this put Guayota at the top of their pool and La Fotta getting 2nd and advancing to power pools. Clapham and La Fotta are joined by Ragnarok in the first power pool. However, today, there was only the match between Clapham and La Fotta. Ragnarok will play both of these teams tomorrow to round out the pool. Both Clapham and La Fotta are missing quite a few key players this weekend. Clapham’s Justin Foord, Ashley Yeo, and Ben Funk, among others, are not in Bologna this weekend. Bologna has their European forces here but are missing some players who are currently in North America including Nasser M’Bae Vogel, Rumi Tejpar, Tim Tsang, and others. However, Clapham has always been a deep team and what transpired here, even with some stars missing, qualifies as a definite surprise. La Fotta started the game off with an easy break after a sloppy throwaway by Clapham’s offensive line. That became a recurring theme. La Fotta’s tenacious defense forced Clapham into throwing error after throwing error while La Fotta’s offense was crisp and smooth. Wolfgang Mitterer, an Austrian pickup for La Fotta, was especially impressive on offense. Clapham would only be able to muster one break the whole game, not even close to enough to dig out of the hole that their offense put them in. La Fotta won going away, 13-7. Clapham rarely loses to European teams. This weekend is the final tryout weekend for the team before the roster deadline for WUCC at the end of the month. Time will only tell if things will improve significantly with their stars back on the field later this season. After Guayota dismantled La Fotta in pool play, fans were curious to see if they could keep this hot streak going against the German champions, Bad Skid. However, this was not to be, as Bad Skid put on a dominant performance, winning the game 13-7. Bad Skid and Guayota will both play Freezzz Beezzz tomorrow to finish out power pool play. With two huge point differentials in the first round of power pools, the losers of those matches, Guayota and Clapham, will have a very hard time reaching the final. However, the winners, Bad Skid and La Fotta, cannot rest easy as Ragnarok and Freezzz Beezzz still have a clean slate to work with in power pool play tomorrow. Comments on "Bologna Invite 2018: Saturday Recap"